This page will tell how to resolve the problem when C drive is getting full and running on low disk space on Windows Server 2012. Download IM-Magic Partition Resizer Server to extend C drive because Windows 2012 says the partition is full and runs on low disk space. Windows Server 2012 reports low disk space when C drive is getting full? What can you do to fix the low disk space problem without reinstalling system or deleting any data? 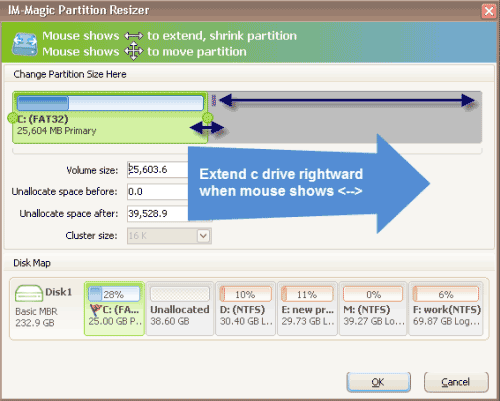 Well, you can use IM-Magic Partition Resizer Server, which is a professional partition tool for all Windows Servers. You can rely on this partition software to resize hard disk so as to reallocate disk space without reinstalling system or deleting any data. This partition software is compatible with all brands of hard disk when it shows low disk space warning on any of partitions including system partition or data partition. When mouse shows double arrows symbol, you can move the arrows to shrink the selected partition. Then, you can get some unallocated space. You need to move the unallocated space close to C drive. Then, right click C drive and choose "Resize/Move" option. Move the arrows when mouse shows double arrows symbol so that you can add the unallocated space to C drive and then click "Apply" button. "This is the first time that I encounter such a problem, my PC runs under Windows Server 2012 operating system says C drive runs on low disk space. Checking the Properties, I realized that there is only little free space left on C drive. 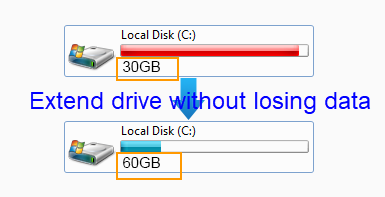 It is nearly full, so I want to know how to resolve the problem about C drive low disk space on Windows Server 2012. What will happen if Windows keeps reporting the low disk space on C drive?" "I have two partitions on Windows Server 2012 computer, but recently C drive on which operating system in installed is running out of disk space. So I want to move some free space from the other partition to extend C drive. Disk Management failed to help move the free space because I was unable to move the unallocated space close to C drive. Now, I am looking for a partition tool which can help move the unallocated space and add it to C drive." When C drive gets full, you can either deleting files to free up disk space or increasing the space of the partition. If you need to free up disk space by deleting or moving files, you should be careful to avoid mistakenly deleting important files. If you want to increase the size of C drive, you need to resize the hard disk. In order to resize hard disk, you can repartition hard disk in which situation you need to backup important data, reinstall system and format the disk partition. You can also rely on partition software to perform partition resizing, in which way you can increase the size of C drive without reinstalling system or reformat disk. If you do not want to repartition hard disk to reallocate disk space, you can use partition software to redistribute hard disk. With partition software, you can fix low disk space on C drive on Windows Server 2012 by adding unallocated space to the partition. What is unallocated space? Generally speaking, unallocated space refers to the space that has not been formatted or used. If there is no existing unallocated space on the same hard disk, you can run partition software to shrink some unallocated space from another partition. The reason why it is recommended you not to repartition hard disk to reallocate disk space is to protect important data from being lost due to repartitioning. If you can use partition software to resize hard disk, you have no need to worry about data loss because it provides safe solution for partition resizing. The partition software enables you to reallocate disk space with original data untouched. During partition resizing, the partition software will never touch any information on the disk or have any influence on the operating system.